Still in the testing phase the instructables step-by-step how-tos are quite a good concept for online collaboration…. 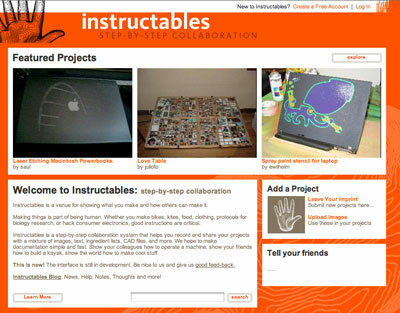 Instructables is a venue for showing what you make and how others can make it. Making things is part of being human. Whether you make bikes, kites, food, clothing, protocols for biology research, or hack consumer electronics, good instructions are critical. Instructables is a step-by-step collaboration system that helps you record and share your projects with a mixture of images, text, ingredient lists, CAD files, and more. We hope to make documentation simple and fast. Show your colleagues how to operate a machine, show your friends how to build a kayak, show the world how to make cool stuff.